Elizabeth Bay House was once known as 'the finest house in the colony'. Bay House is a fine example of colonial architecture. 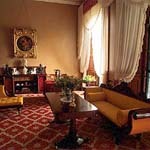 Inside, it is elegantly furnished to the period of 1839-1845, reflecting the lifestyle of the Colonial Secretary, Alexander Macleay. Visit the Elizabeth Bay House web site.